Along with the Whitsunday Islands, Fraser Island is a staple stop off for backpackers heading up, or down, Australia’s East Coast. My friend, Rachel, and I stopped off at Fraser Island where we boarded a ferry with a group and spent two nights on this sandy island. If you’d like to plan a visit to Fraser Island here’s how to get there along with what to pack and what to do during your visit to Fraser Island. How much does it cost to visit Fraser Island? Fraser Island is the world’s largest sand island and is just off the southeast coast of Queensland. 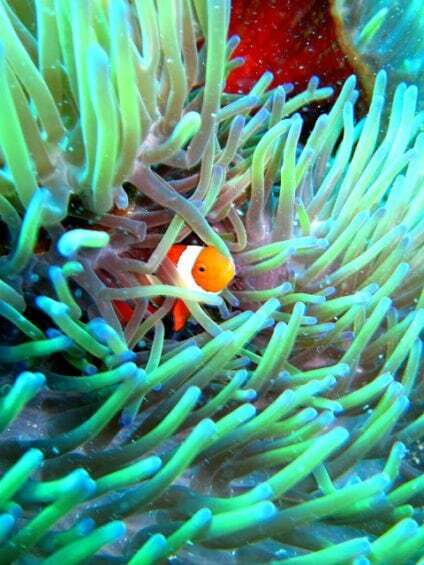 It’s a Unesco listed island and is one of the best wilderness adventures you can have in Australia. The island stretches on for over 120km and is full of untamed beaches, old-growth forest, lakes and wildlife. The only things it lacks are infrastructure and paved roads! Which is what makes a visit to Fraser Island so great! Fraser Island’s most infamous inhabitants are the dingos. Whilst they may look like rather cute dogs they’re in fact pretty dangerous. You’ll have to take special precautions to make sure your camp isn’t raided by dingos! Getting to Fraser Island involves taking a small boat – as you’d expect when visiting an island! One of the most popular ways to get to Fraser Island is to take the Manta Ray barge. This runs between Inskip Point and the southern tip of Fraser Island. It costs about AUS$120 return per car and takes just 10 minutes. 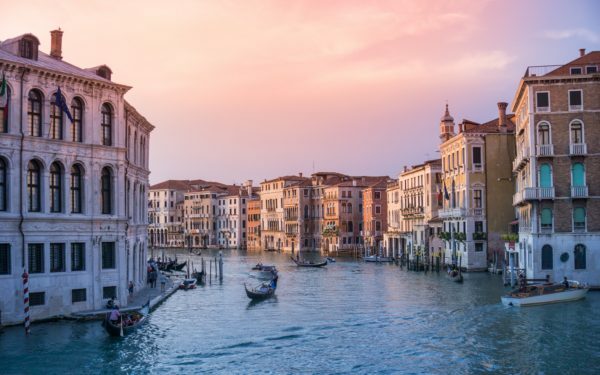 The barges runs from 6am-5.15pm daily. If you’ve booked on to a tour of the island with a company the cost of this should be included in your package. Alternatively, you could take a boat with Fraser Island Barges. These are less frequent and go from River Heads (just outside of Hervey Bay) to Wanggoolba Creek and Kingfisher Bay on the west of the island. These journeys are a bit longer – about 50 minutes – but do cost a little less at AUS$105 per vehicle. There are no paved roads on Fraser Island and as a result it’s not recommended to take anything other and a 4WD with high clearance. Cars without this are likely to get damaged or stuck in the sand and boggy ground. If you don’t have a 4WD you can hire one from several places before catching the barge. You must be 21 and over to be able to hire a 4WD. You can rent a 4WD from the following companies in Hervey Bay amongst others. You can also rent from Rainbow Beach if you’re catching the barge over to the southern tip of Fraser Island. A vehicle permit costs $45.10 for up to a month and must be placed on the left hand side of your windscreen/dashboard so that it is visible from the outside of the vehicle. Since a trip to Fraser Island is a wilderness trip, you won’t find many hotels to stay in (although there are a few!). Most visitors choose to camp! If you are camping then you’ll need to purchase a camping permit. This applies whether you plan on camping in a designated camp ground or not. You can buy a camping permit online at QLD.gov.au. You can also buy it in person at the QPWS office at Rainbow Beach or Eurong (on the island). 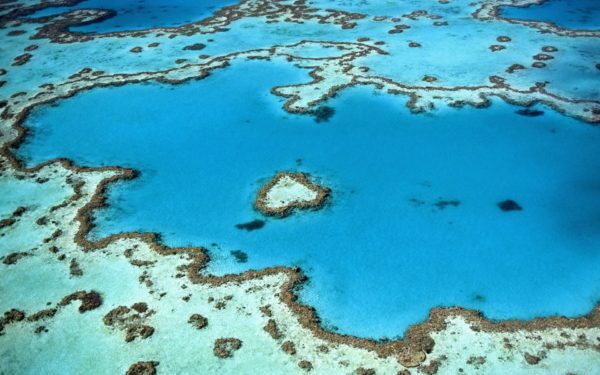 Make sure to print your permit before you head to Fraser Island. Once on the island attach your Fraser Island camping permit to your tent or camper van. If the inspection officers can’t see your permit, or you don’t have one, then you could be fined. Camping permits cost around $6 per person per night and children under 5 are free. If you want to shower during your stay then you’ll need to take extra change to pay for this! There are 45 camping areas across Fraser island. These vary in terms of facilities so pick according to your preference. Some campgrounds have ‘dingo deterrent’ fences which help stop dingos getting too close. People say that the most picturesque camping spot on Fraser Island is Central Station. Central Station campground is towards the middle of the island and is a great place for exploring the lakes. 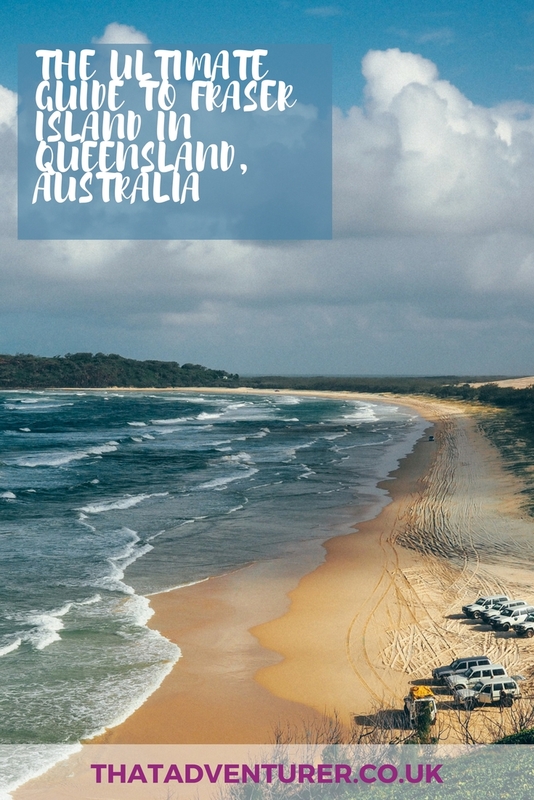 You can find out more about camping on Fraser Island on the Government of Queensland’s website. The vivid blue of Lake McKenzie tends to be on most guided tours. I stopped off here on my tour of Fraser Island and went for a quick dip! Eli Creek is freshwater and makes a great spot for a relaxing float along with the current. There’s a boardwalk which takes you to the top of the creek too. 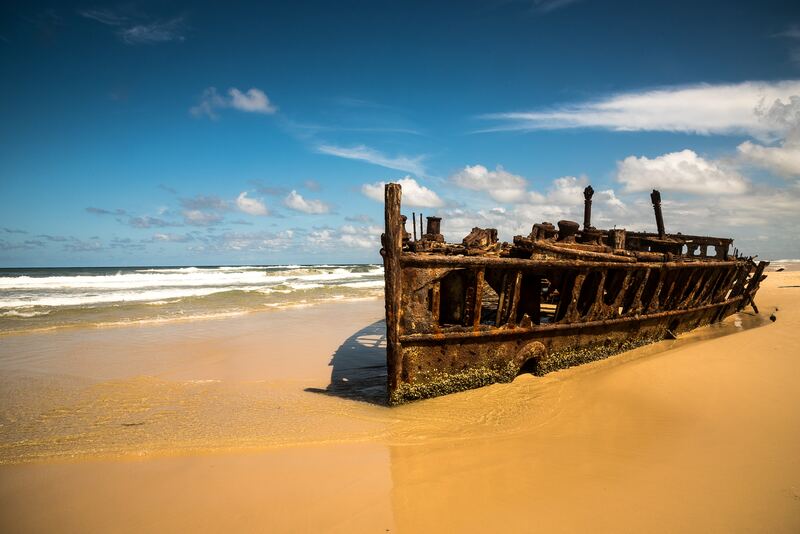 The SS Maheno Ship wreck is also on pretty much every Fraser Island itinerary. The ship was wrecked in 1935 when it was being towed to Japan for scrapping. Before this time the SS Maheno was used for bombing tests during World War II. Nowadays you can see it at low tide washed up on the beach. The Pinnacles are coloured sand cliffs on the eastern beach of Fraser Island. 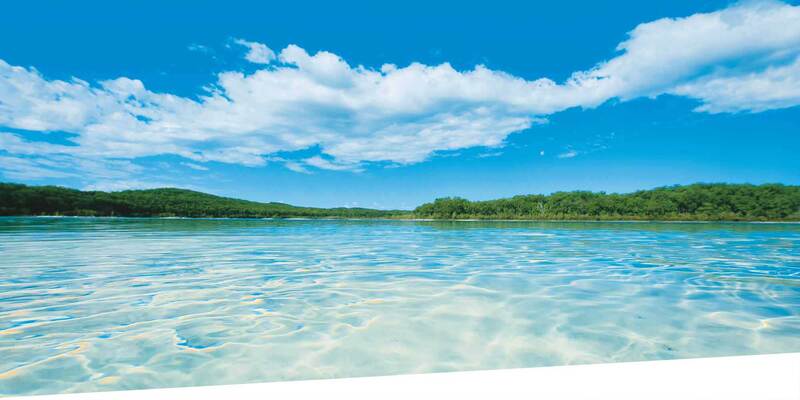 There are said to be up to 72 different colours on Fraser Island although most are red or yellow. This spot is one of the best places on the island to see the coloured sands. Lake Wabby is a green coloured lake with a large sand dune. If you fancy it, you can run down the sand dune before diving into the refreshing lake at the bottom. If you’re lucky you might spot some freshwater turtles and fish! 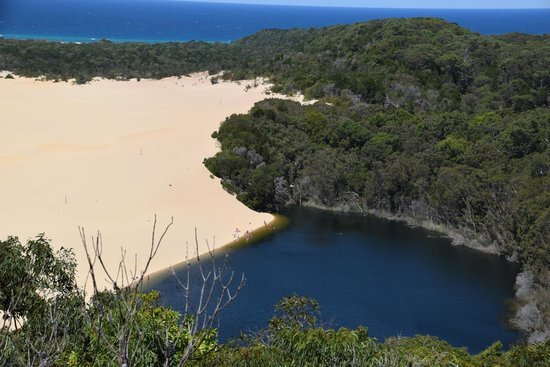 Lake Birrabeen is more inland and the drive here is a fun, peaceful 4WD adventure! You’re not usually advised to swim in the waters around Fraser Island. And, if you head up to Indian Head bluff then you’ll probably find out why. It’s not uncommon to spot sharks patrolling the waters down below or even rays! 75 mile beach stretches along the entire eastern side of Fraser Island. It’s also considered the main road! Most of the things to do on Fraser Island such as the Pinnacles, Eli Creek and the Maheno wreck are found along this beach. One place you can swim safely is the rock pools near Waddy Point. 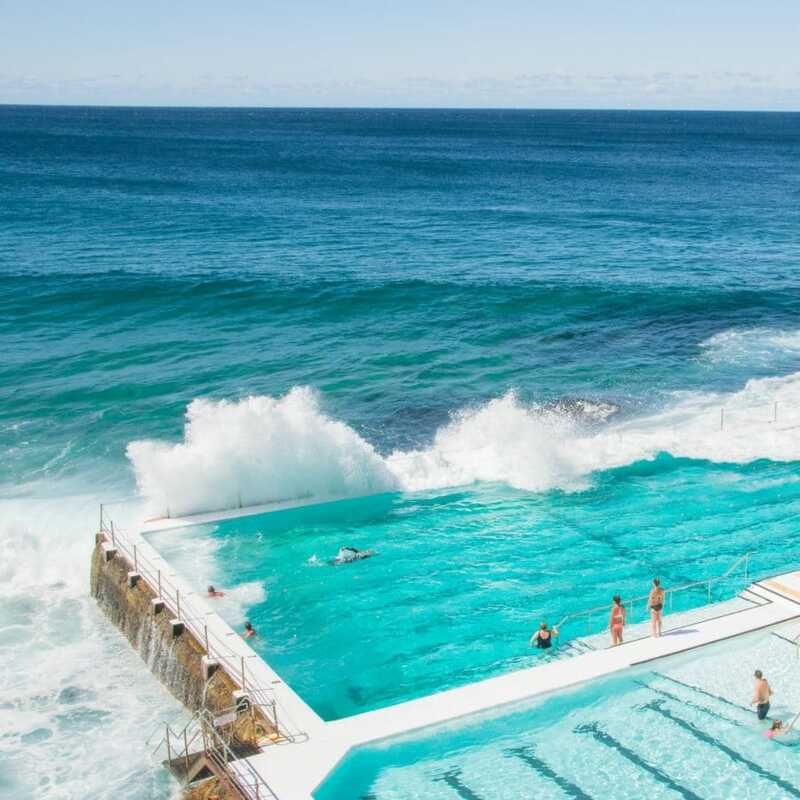 These are known as the Champagne Pools. 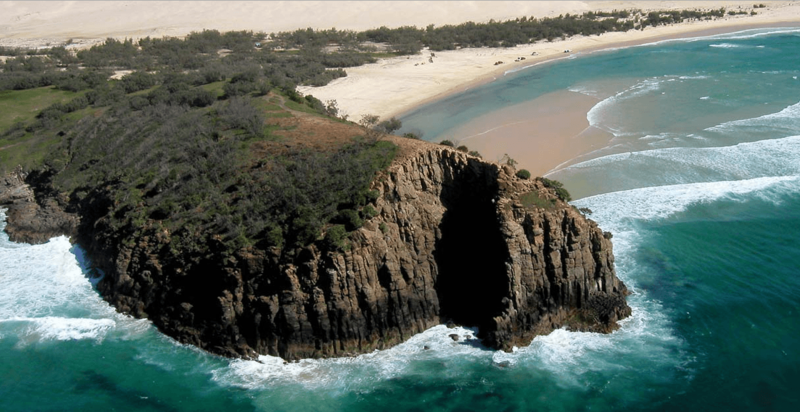 Up in the northeastern tip of Fraser Island is the heritage Sandy Cape Lighthouse. Not many travellers make it all the way up here but if you’re spending a week or so on the island it’s worth the visit. Costs of visiting Fraser Island vary depending on how you’re travelling there. If you have your own 4WD you’ll obviously find Fraser Island a bit cheaper as you won’t need to hire a car or join a tour group. If you don’t have your own 4WD you should consider joining a tour group as this can make things a bit cheaper since the tour includes car hire, permits, food and tents. Accommodation: Assuming you’re camping this is around $6 a night per person. However you’ll need to already have tents and camping equipment. Cost of food: This depends on what you want to bring (e.g. alcohol). Goon is a cheap way to drink and you’ll also need to pack extra cartons of water. Budget for around $50 for a couple of nights. 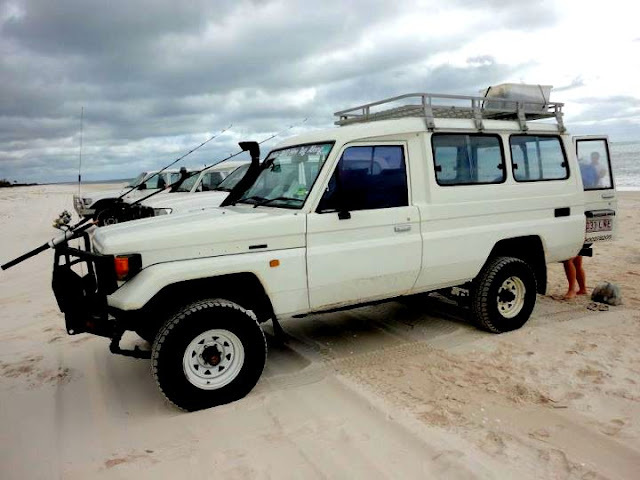 Transport: Expect to pay about AUD$200 per day for a 4WD rental for Fraser Island. A first aid kit for both yourself and your car. Your car’s first aid kit should include items such as; radiator coolant, a spanner set, gaffer tape, a can of WD40, jumper leads, zip ties and a spare fan belt. Extra fuel: Whilst Eurong, towards the east of Fraser Island, has places you can buy fuel it’s best to bring extra with you too. Distances between attractions might not look far on the map, but Fraser Island’s roads will guzzle your fuel! A camping stove: Campfires are only permitted in a select few campsites. This means you’ll have to bring a stove for cooking on. An air pressure gauge: Sand driving requires slightly deflated tyres so you’ll have to pack an air pressure gauge to do this. You’ll also want bring or rent some recovery gear including a shovel in case you need to dig yourself out of sand and/or mud. A map & GPS system: It’s extremely important to bring a good map of the island and a GPS system. Most of the time you’ll probably be without phone signal so you can’t rely on your data. If you’re booked on to a tour of Fraser Island they’ll have taken care of all this so you don’t need to worry! All you’ll need to bring are clothes, toiletries, personal medications, sun cream, clothes and shoes. Oh and maybe some new songs to play in the cars! During my trip to Fraser Island we didn’t see any dingos. At first I was disappointed but then I learned how dangerous they can be. Keep all food locked up in a vehicle and never feed dingos. You will be find for failing on either of these. Small children can attract a dingo’s attention so keep them close. Running can also have the same affect so walk everywhere while on the island. Once you’re finished cooking clean up straight away. Dig a deep hole away from your tent to pour the washing up water into if there are no facilities. If you’re threatened by a dingo you should stand still and fold your arms across your chest. Face the dingo, then calmly back away (if you are with another person, stand back-to-back). Call for help, but wait until the dingo is gone before you continue on your way. Never run or wave your arms. In an emergency, call 000 or 112.